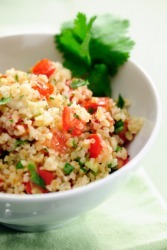 Tabuli is an alternative spelling for tabbouleh, which is a Middle Eastern salad of bulgur wheat, tomatoes, green onions, mint, olive oil and lemon juice. An example of tabuli is what you'd be served in a Middle Eastern restaurant with lamb kebabs. "tabuli." YourDictionary, n.d. Web. 09 April 2019. <https://www.yourdictionary.com/tabuli>.